ABC Affiliated Company Says Something HORRID About Trump Fans! President Trump is endlessly attacked by the mainstream media [ABC,NBC,CNN,CBS, and even some of Fox News]. Sometimes the MSM is right, but there are way too many times where they inaccurately portray the President. It happens so often, that it is clear the media is out to get Trump. Wow, President Trump refuses to address a media that distastefully covers him & negatively attacks every small thing he does? I’m shocked! As you see in the video above, the media said he would never win this or that and then he did. And then they said Trump would be obliterated by Hillary. And that did not happen. And that does not mean Trump will be able to defy everything that the media says he cannot do, and it does not mean Trump will be a successful President [so far he’s fine]. But the media is on a 24/7 365 witch hunt against Trump. I mean the guy is over 70, a billionaire businessman celebrity, has just a fantastic wealthy life and works really hard as well. And you’re telling me that this A-lister Donald Trump, worth more money than you could even think, hasn’t been able to have a controversy brought from the past by the media that crushes him? WOW. The worst they could find on Trump was ‘grab the puzzies’.. Lmao. So NBC says Barron Trump will eventually shoot up a school like Adam Lanza, CNN is giddy over the sick idea that Trump could get assassinated, ABC has a so called ‘journalist’ crying on set when Trump wins election — blowing open the bullsh*t claim that she was a bipartisan debate host. You’ve got everyone attacking POTUS, and now this lowlife anchor from Chicago wants to get his name big. Chicago has many problems that Trump, with fellow politicians and Americans, can settle out. As long as self-righteous, loathsome douchebags like this sports anchor doesn’t keep driving a wedge between Trump fans and America. So basically, when Hillary doesn’t hold pressers and dodges questions like a goofy ten year old would, and gets asked questions with oranges [it would be better if they used softballs] — it doesn’t matter to so many because they’re brainwashed by the left-wing media corporations.. Thank God for WikiLeaks exposing her. Soo Hillary doesn’t do anything, and she’s corrupt, and ‘all talk, no action’ .. yet the media chooses to attack Trump over and over throughout his campaign and still to this day. ABC-affiliated company, Chicago-based local news channel obviously hires bigots. The ABC-controlled WLS channel has suspended their sports anchor after he went on Twitter and lashed out at Trump voters. This ABC anchor, Mark Giangrecho, goes by the ‘Cynical Smartass’ according to his Twitter. Lmao! Both tweets were cowardly deleted. So Hillary calls us, that roam below her majestic stature, a “basket of [irredeemable] deplorables” and basically talks more harsh about Trump fans than she does about ISIS. 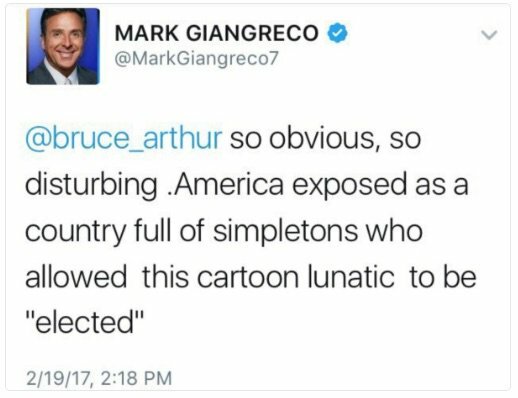 But then this ABC-affiliated sports anchor goes on Twitter and calls voters “simpletons” that voted a “cartoon lunatic” into office. That’s offensive to so many people, who proudly & patriotically stormed the polls and cashed their vote for Trump. Unsurprisingly, this immature snowflake anchor refused to comment when reached on Thursday. Wimp! The story was tremendously broken by Chicago City Wire. And then it spread. Giangreco also thinks it’s funny to make jokes about suicide, as long as it’s in reference to NFL games. He’s truly a mentally-ill guy! GET HELP, MARK! Nope, you stay home Little Mark-o. Previous Previous post: #BoycottRedState: RedState Shames Sean Spicer For Fake News, Yet WORSHIPS CNN Jake Tapper. Next Next post: Ghostbusters’ Leslie Jones Calls President Trump ‘A Pig’ & Says She Wants To Punch White Girls In Mouth. Totally SICK!